I love simple, DIY face masks that don’t require a ton of ingredients. You’ve come to the right place! These two ingredient face masks are the perfect quick pick-me-ups to fix a slew of different skin issues such as acne prone skin, aging skin, dull skin, and much, much more! These two ingredient face masks take only minutes to make and they’re actually super effective! Let’s dive in and have ourselves a well deserved spa day! I do masks almost every night. And always one that suits my skin for that night. If I was oiler that day I do one for it or dry or looking that I need more brighter.. Enjoy the DIY! Mix coffee grounds and honey together in a small bowl. Apply to a clean face and neck and leave on for 10-15 minutes. Remove by gently massaging into the skin to exfoliate. Rinse off and pat dry. Use 2-3 times a week to prevent fine lines, wrinkles, crows, feet, and to plump up skin! Mix yogurt and lemon juice until it forms a paste. Apply to a clean face and neck and leave on for 10-15 minutes. Rinse off with cold water and pat dry. Repeat 2-3 times a week to reveal radiant, glowing skin! Mix coconut oil and turmeric to form a liquidy paste. Gently massage into face and neck and leave on for 10-15 minutes. Rinse off and pat dry. Use 2-3 times a week to hydrate and exfoliate. Combine honey and cinnamon to form a paste-like consistency. Apply to a clean face and neck and leave on for 10 minutes. Use 2-3 times a week to erase acne scars and to prevent future acne from forming. 1 tbsp tomato juice ( juice your own or take tomato and grate it till it is mush. Combine coconut milk and tomato juice and apply to a clean face and neck. Leave on overnight and rinse off in the morning. Use twice a week to brighten dull skin! Combine honey and lemon juice and apply to a clean face and neck. Leave on for 10-15 minutes and rinse off. 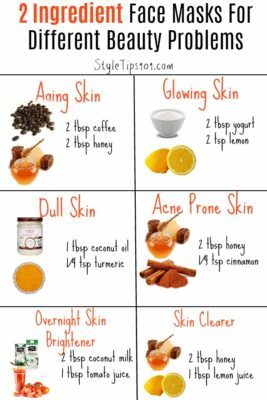 Repeat 2-3 times a week to clear up acne prone skin.